Okay, so I am the only one of my friends who is unmarried. Wait, God. Did I miss something? Maybe it’s the guy who sat next to me in church 3 months ago? The one with the nice smile and straight teeth. The one who made it a point to greet me during tithes and offering and make remarks about the message to me. The one who asked for my number so we can have Bible study but for some strange reason, I got a strange feeling in the pit of my stomach and turned him down? 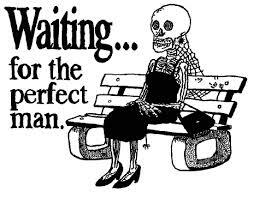 Waiting for your special someone is not an easy feat. Let me tell you. Last weekend, I met a guy who made my skin crawl. Needless to say, a date with him will not be on the agenda in the near future. Given this, I still find myself stressing about why I am not meeting anyone. I have tried everything. I have read all the relationship blogs. I go out; I meet people; I’ve even joined an online dating site. Nothing is happening. If there is anything that life has taught me in the past 20-something years is that the best things come easy and in its own time. There is no need to force a relationship or meeting the right one. Perhaps I am not meeting anyone because today is not the right day. My guy is wherever he is getting prepared for that day when I will walk into his life. And what am I doing? Worrying. What if I missed him? The thing about me is that when it comes to men, I have impeccable instincts. I knew right off-hand that the guy that i met at last weekend’s party was fishy. I said mentioned that he was “feeling me” and wanted to spend more time with me, but when I checked his Facebook profile, all I saw were scantily clad women posting seductive messages on his wall. Sure enough, he was a player. He took my number and never called me. The men who I feel comfortable around usually stick around, whereas the men who I feel “funny” around, only stick around for a little while. A woman’s intuition is powerful. So, here’s my formula. I hope it works for me and I am prescribing it to you. Sit back, relax and enjoy the ride of life! Dont try to figure it out or compare yourself to others. Your path is awesome and different from theirs.